What do Karl Lagerfeld, Oscar de la Renta, Paris Hilton, and Andy Warhol all have in common? They’re all among the fashionable subjects photographed by the likes of Steven Meisel, David LaChapelle, Bruce Weber, Patrick Demarchelier, and the late Herb Ritts that will be up for bid at The Humane Society of New York’s Fine Art Photography Auction on April 16 at the Baryshnikov Arts Center. Honorary chairs Cornelia Guest, Elliott Erwitt, and Tony Bennett, as well as Bruce Springsteen, BeKind founder Frances Hayward, and Alessandra Ambrosio are among those invited to the private affair. 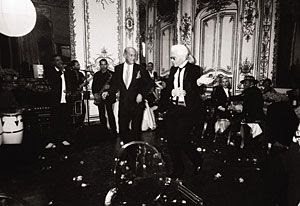 Though over 175 photographs will be on display throughout the arts center that night, Donald McPherson’s shot of Lagerfeld and de la Renta dancing is a strong contender for the most buzz—and highest bids. McPherson captured the duo in black and white at Lagerfeld’s home in Paris in August 2002 during a party celebrating both de la Renta’s last couture collection for the house of Balmain.